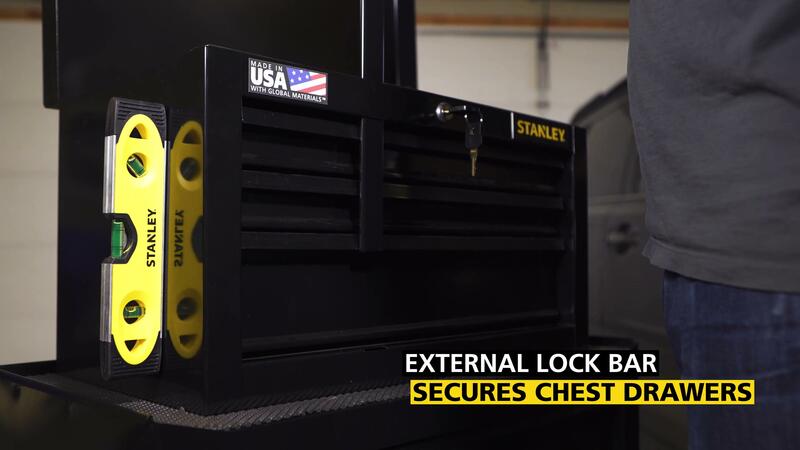 Proudly designed and made in USA with global materials, the STANLEY® 5-Drawer Tool Chest & Rolling Cabinet is the ideal storage solution for all your tools and supplies. This product features five 30 lb. capacity drawers and a bulk bottom storage area. It includes a keyed locking system with an external lock bar to secure the chest drawers and all that you store in them. Made in the USA with global materials. 30 lb. ball-bearing drawer slides for smooth movement. Hinged lid support keeps chest lid open during use. Bulk storage measures 26 in. W x 13 in. D x 15.3 in. H for power tools and bulky supplies. Full width black steel drawer trim. Top mat helps protect cabinet work surface. Keyed locking system with external lock bar secures chest drawers. Four, 3" x 1" Casters support a 300 lb. load capacity.